On a warm morning in May, the Grand Canyon’s South Kaibab Trail feels as crowded as a Macy’s escalator the day after Thanksgiving. The dawn light on the canyons and cliffs is stunning; the people around me are distracting. Although I caught the early bus to the trailhead, I can see several groups on the trail below. With every arriving shuttle, more will come behind. Most of my fellow travelers seem intent on their destination, Phantom Ranch at the bottom of the trail, or the North Rim 17 uphill miles beyond. The hike takes on the nature of a race, people wearing looks of grim determination and angling for a less crowded spot on the trail. Why are they here? Because hiking rim-to-river or rim-to-rim is a feather in the cap, a trophy on the wall — The Thing To Do. For the hiker in search of solitude rather than a physical challenge, the South Kaibab is no place to be. But that first impression isn’t entirely accurate. After playing leap frog with thirty or so hikers on the descent of Cedar Ridge and the traverse beneath O’Neill Butte, I decide to take a break at Skeleton Point. I assume it will be as crowded as the trail has been. But strangely, no one else is taking advantage of this rest area out of view of the trail, and no one comes for the 15 minutes I spend here. This confirms what I’ve found in other national parks: as crowded as they are, it’s not that hard to find a bit of solitude. Some guidebooks and articles suggest that you need advanced climbing and canyoneering skills to avoid other hikers, but it’s just not true. Simply choosing the right trail, or even stepping a few paces off the busiest trail, can take you into your own private world away from the crowds. I’ve planned today’s hike to provide maximum solitude, using two of the Grand Canyon’s busiest trails, and connecting them with a little-used trail. Below Skeleton Point, the trail corkscrews down cliffs of Redwall limestone, then gently traverses onto the broad Tonto Plateau. Here, at a rest area complete with outhouse and telephone, I silently bid farewell to the mad fools rushing down to the river, and strike out west on the Tonto Trail. One set of bootprints is the only evidence that anyone has been here before. The change is immediate. Gone are the voices and the clank of aluminum hiking poles against rock. The absolute silence of the Grand Canyon engulfs me, broken only by the occasional breath of wind in my ears, the buzz of a fly, the call of a canyon wren. These are mere punctuations that only emphasize the silence. Behind me I can see more hikers coming down the Kaibab Trail to the junction, and I wonder if they wonder why I’m going off in this strange direction. I may not want to descend all the way to the river, but I do want to get a good view of it, so I take a detour out to a point overlooking the Inner Gorge. From this point, I’m looking almost straight down the contorted cliffs of black Vishnu Schist to the river, placid here, and the Silver Bridge crossing it. A couple of hundred feet below me and a quarter mile away, my recent companions have stopped for a break on the point known as the Tipoff. From this remove they are no longer annoying, but mere figures dwarfed by the vastness. They remind me of the mountain pilgrims depicted in Asian landscape paintings: a vital element of the scene, but just a tiny part of it. The human presence here, my own included, shrinks to tiny proportions. The canyon has swallowed us whole. I wonder if I should follow those hikers down to the river, after all. It looks so close from here, and my map shows that it’s only a 1,500-foot descent from where I now stand. Am I in shape for that, and the 4,500-foot climb back up? I could probably do it, though I wouldn’t feel great by the end. But there’s something else, besides the extra fatigue and the likely crowds at Phantom Ranch – it looks awfully closed-in down there. I imagine the dark walls of the Inner Gorge looming over me, creating an ominous mood. Besides, I’ve been down to the river before, long ago at Havasu Canyon. In my impression, the river is just the river, and the grandeur of this place lies elsewhere. So I return to the Tonto Trail and begin my journey westward. The trail undulates across the plateau, descending gradually toward Pipe Creek. The term “plateau” is deceptive, since the Tonto only seems flat when viewed from above. Now that I’m down here, the plateau’s gentle, riverward slope becomes apparent, as do the numerous side canyons – vast gulfs in their own right – that cut across it. This is also a completely different environment from that on the rim. In two hours, I’ve descended from the mountain world of ponderosa pine and gray squirrels, through the high desert world of pinyon and juniper, to this low desert world of black brush, yucca, catclaw acacia and rock. Everything is open and apparent, the forms of the landscape revealed in frank austerity. Now that I’m on relatively level ground, I can pay more attention to this landscape. On the main trails, even the gentlest of which plunge steeply down the cliff faces, I tend to keep my eyes on the path at my feet. On the Tonto, I can look up as I walk, enjoy the view, and notice the scenery changing as I pass. I get a feeling of moving through the canyon. It suddenly becomes three-dimensional, alive. Nearby landmarks, like the gash of Bright Angel Creek carving through the North Rim, recede slowly as I proceed hour-by-hour; yet Havasu Point, the farthest spot visible to the west, hardly seems to draw closer. The vastness of the place, taken for granted when viewed from the Rim, hits me with renewed force. I move deep in the immensity. As I round the end of the ridge descending from O’Neill Butte – I was up there just a couple of hours ago – the Yavapai Observation Station comes into view, barely visible on the rim above. I try to remember the crowds up there and the traffic jam in the parking lot, the people saying “it doesn’t look that far to the bottom” – but none of it seems real. Reality is right here in front of me, the trail arcing through the gray-green carpet of blackbrush and four-winged saltbush, the towering Redwall Cliffs above, a chuckwalla sunning itself on a rock. This is reality, and everything in what we call the civilized world is just a dream. The desert heat is increasing as I approach first Burro Spring and then Pipe Creek, with their brilliant green cottonwoods, those green-eyed gods of the desert. Live very long in desert places, and these manifestations of water take on the trappings of deities. Water itself becomes the source of all existence. Or think of water as a master alchemist, turning a drab, brown landscape to brilliant green and gold. In a place where living things are usually spaced well apart, life bursts forth in gaudy profusion: skippers and frogs in the water, a dense growth of reeds and arrowweed along the banks, tracks left in the sand by night visitors to the life-giving water. And, over all, a kind of hum behind the silence, as if the heat waves rising from the canyon walls have an aural component. Sitting with bare feet in cold Pipe Creek, shaded by the shimmering, electric-green cottonwood trees, the sun baking the deep red cliffs beyond — that’s one tantalizing version of Paradise. But water is not the only sorcerer here — geology works its own kind of alchemy. Plant communities, temperature, angle of slope, footing, availability of water: walk a few yards and, alohomora, all of this changes as you cross from one sedimentary layer to the next. Exploring upstream, I find the source of the creek where it emerges in a trickle from an overhang in its bank. Beyond this point, the bed is as dry as the slopes around it, the banks far less lush than at the trail crossing. Why does the water emerge at just this spot? A harder layer of rock must lay just below the surface here, forcing the subterranean water into the open. I find that bedrock layer farther downstream, below the trail crossing. An exposure of white slickrock holds a series of small pools, like a necklace of turquoise and ivory. Again the trees and shrubs disappear, and there is only rock and water. 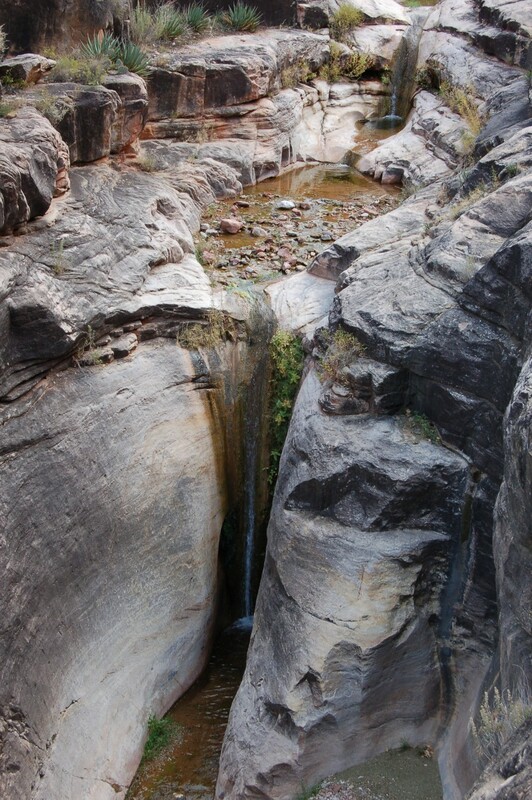 Then comes a 15-foot waterfall, followed almost immediately by a longer plunge through the Tapeats Sandstone to an amphitheatre below. The water disappears through a horseshoe-shaped gap in the rock, beyond which I can see the tops of more cottonwoods. Gingerly, I work my way along ledges of sandstone to a point overlooking the final drop. I still can’t see the point where the water hits bottom. Space whirls; vertical becomes horizontal, the waterfall as level as a city sidewalk. I’m tempted to step onto it, to follow the water downstream. Head swimming, I retreat to firmer ground. This is the price of solitude. If I fell here, even if I just broke my ankle, how long before someone found me? But it’s a price I’ll gladly pay. I enjoy feeling responsible for myself, no partners to rely on, no one to blame if things go wrong. And that slight sense of risk, of being on the edge, sharpens the senses. Alone, I experience more, feel the place more, than I do when I hike with friends, even just hikers met along the trail. Nothing comes between me and this canyon world of rock and sky, of endless stretches of space and time, where I come closest to meeting the infinite. Risk is the currency that buys such treasures. Returning to the Tonto and the glaring sun, I resort to what I call “lizard mode,” moving slowly, eyelids half closed, breathing steady, trying not to overheat. 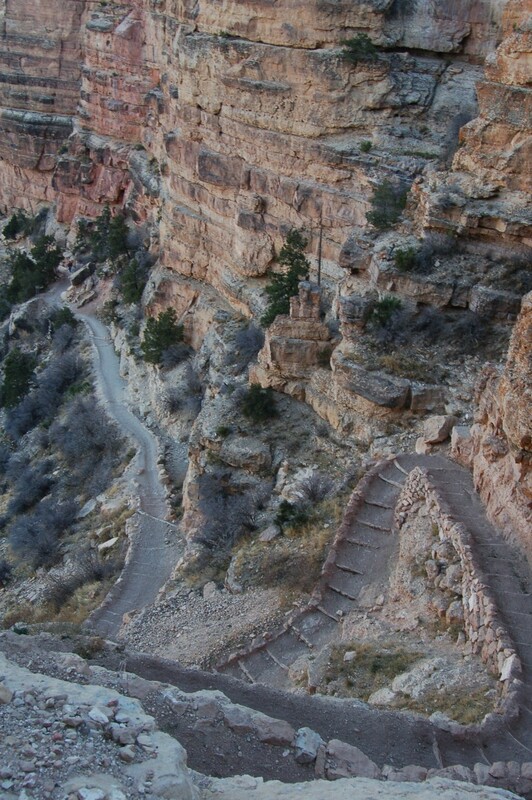 Soon, I arrive at the junction with the Bright Angel Trail and its crowds of hikers. Indian Gardens, though more lush than Pipe Creek, bears the burden of too much civilization, with its pumphouse, corrals, ranger’s home and campground. It’s too close to what I call the “flip-flop line,” that point beyond which no person, no matter how foolish, unprepared or insane, would walk in thongs. Still, even here I find a quiet spot to myself near Garden Creek, with trails carrying hikers on either side. They seem unaware of my presence, as does the western tanager flitting from branch to branch nearby. Later in the afternoon, a bobcat strolls with regal unconcern through the grass on the other side of the creek, then beds down beneath a tangle of grape vines. We regard each other calmly, fellow refugees from the mid-day heat. I wait until late in the afternoon to leave the shade and cool of the oasis, when the shadows of cliffs extend out to the Bright Angel Trail. Hikers are returning from the river now. Having baked themselves on the switchbacks of the Devil’s Corkscrew, they look haggard, their feet shambling along the trail, in contrast to the sprightly steps that carried them into the canyon. I ask a particularly heat-exhausted woman if she needs water or food. She just stares at me out of faraway eyes, as if, having traveled so far into this great void, the void has entered her – as it enters all who venture far in Grand Canyon.